I have 4 cleansers to share with you today that I've been testing over the past 2 months. All are quite gentle on my skin and easy to incorporate into any skincare routine. While I love products that help target certain concerns, I have been drawn to simpler and more gentle cleansers recently to nourish and calm my skin while I let the serums and strong moisturizers in my routine do their work. 1. 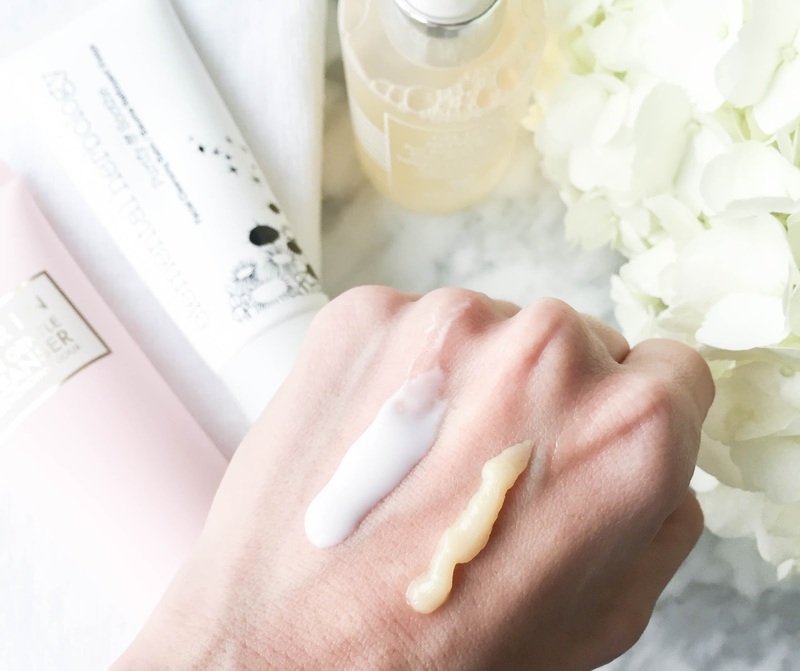 Aerin Rose Gentle Cleanser - Not only am I a fan of her fragrances, but every skincare item I try from the Aerin line seems to always work for my skin. 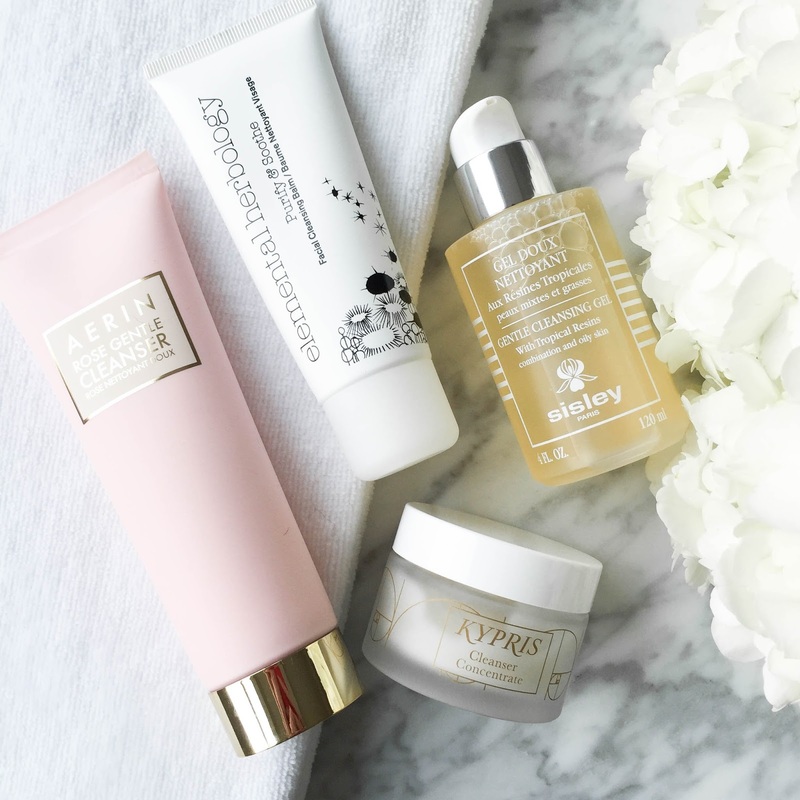 Most of the Aerin products seem to be geared towards calming and nourishing the skin which is why I go back to them over and over (I use this oil regularly and am currently testing this night cream). The Rose Gentle Cleanser name perfectly describes the product - it is a cream cleanser that hydrates, soothes and calms my skin with a scent of rose infused throughout. Recently I have been going hard with a lightening serum and a retinol cream now that we are transitioning into fall, so I like to have a gentle cleanser in my routine to comfort my skin. 2. Sisley Gentle Cleansing Gel - Cleansing Gels can be hit or miss with me since many can dry out my skin leaving it tight and uncomfortable. Since I have had wonderful luck with using other Sisley cleansers (this foaming one is beautiful as is this cleansing milk), I was confident this gel would be great on my skin. Initially I felt it was going to foam when adding water, but was pleasantly surprised to see is turn into a lightweight cream that left my skin feeling extra clean and fresh but without the dreaded tightness or dryness. I would recommend this more for combination to oily skin types rather than for someone with drier or more sensitive skin. 3. 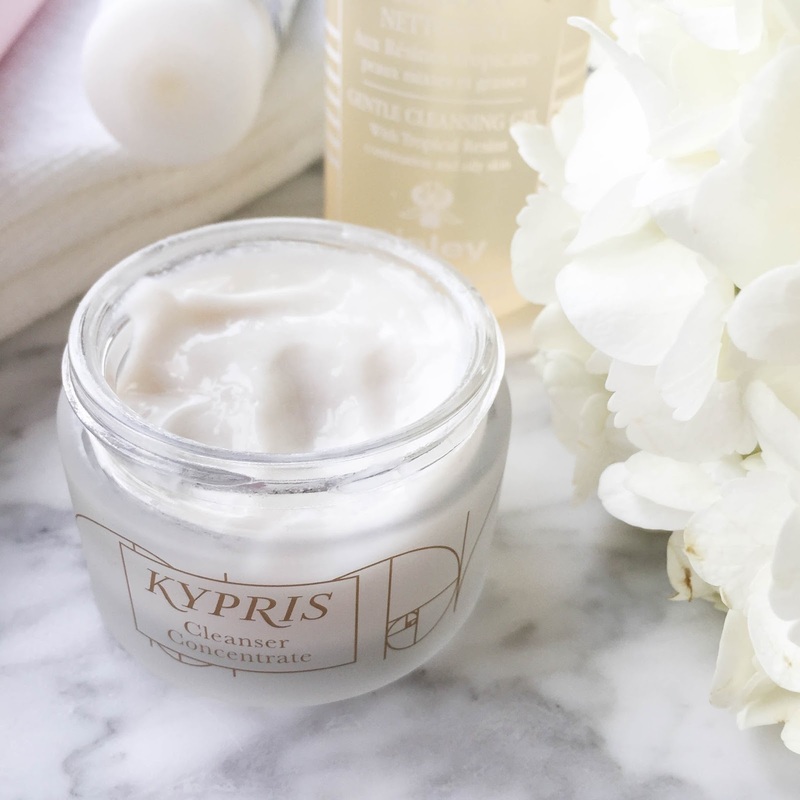 Kypris Cleanser Concentrate - After falling in love with this serum and this serum from Kypris, I knew my skin would be in good hands with their cleanser concentrate. It's a lightweight cream that feels cooling on the skin. I like it best used as a morning cleanse with dry hands and a dry face. I massage it in for 30-60 seconds, wet it to emulsify slightly and then use a warm cloth to remove. It gives me a slight exfoliation with the cloth but the cleansing cream helps to hydrate my skin and leaves it feeling smooth and supple. With ingredients of moringa, probiotics and prickly pear, this cleanser is wonderful at helping balance the skin and is gentle enough for any and all skin types (always patch test first though). Annnnd Kypris continues to amaze me - such a great line. 4. Elemental Herbology Purify & Soothe Cleansing Balm - As I have said many times before, cleansers are the first products I like to test from a line that is new to me. So that is exactly what I did when I was introduced to Elemental Herbology. I went right for their Cleansing Balm to gauge how it worked before deciding on if I will move forward with the line. The texture is rich and thick but not as oily as many of my cleansing balms in jars or pots. While I have used it to remove makeup, I find that it did a better job as a second cleanse or morning cleanse. A cloth is a must when rinsing it off, and my skin is left soft and plump feeling. If you are wanting to add a cleansing balm into your routine, but prefer one that is not as oily - this may be a great option for you. I am not typically someone that gravitates towards natural or organic skincare, but I have had such a great experience with all the brands that I have discovered lately. Looking forward to incorporating more into my routine! I've had my eye on the Kypris one for a while! Gotta finish up my current cleansing balm before I can justify it though- side not- think you'd really like the one i'm currently testing out, its by Hemish. - It just MELTS off your makeup. Love it! Just bought the Aerin Rose cleanser. I'm excited, it seems nourishing. I hope it will work as a first cleanse, so I can continue to use the La Mer cleansing gel after.